Practically speaking, the 10-year fixed rate is Canada’s longest mortgage. A few lenders have longer terms, but their rates are not economical. People choose 10-year terms because they desire much longer rate and payment certainty than a 5-year fixed. 10-year mortgages have historically cost borrowers much more interest than variable and shorter-term fixed rates. Only a minority of people keep a home for 10 years. That raises the odds they’ll renegotiate before maturity and pay a penalty to get out of their 10-year mortgage. Roughly 5% of borrowers choose a 10-year fixed term. 10-year terms are generally the most profitable term that a mortgage salesperson can sell (because the compensation is highest). 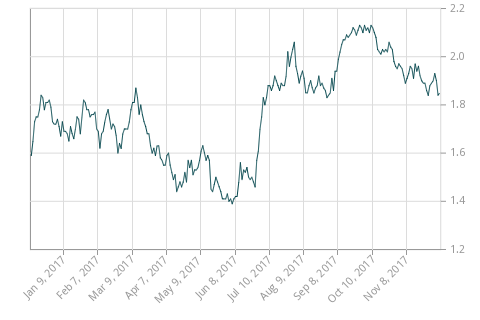 If you want to guesstimate where 10-year rates are headed short term, keep an eye on Canada’s 10-year government bond yield (below).